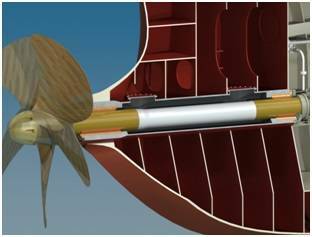 Classification societies are changing their monitoring rules for seawater-lubricated propeller shafts in line with the rules governing the inspection and withdrawal of oil-lubricated stern tube systems. China Classification Society (CCS), for example, announced in July that if certain condition monitoring criteria are met, shaft withdrawal for inspection may be extended to 15 years. The rule change follows recent revisions by Lloyd’s Register and Bureau Veritas which published amended SCM and MON-SHAFT rules in January 2013 and January 2014, respectively. “Changes to classification society rules represent a significant breakthrough for manufacturers of water-lubricated shaft bearing systems,” according to Andy Edwards, Commercial Director of market leader Thordon Bearings. “A major stumbling block to the wider take-up of the more environmentally efficient seawater-lubricated system has been the requirement to withdraw the shaft for inspection every five years. So the changes are very welcome as they are more representative of the advancements made in polymer bearing technologies and corrosion-resistant shaft coating systems,” Edwards explained. The revised CCS notation stipulates that certain shaft condition and monitoring protocols have to be verified at each annual survey in order to benefit from extended shaft withdrawal periods. The rules state that a shaft condition monitoring system may be used in place of conventional shaft withdrawals, such as the retention of water sampling results for class surveyor review. It also stipulates that a water-lubricated shaft has to be protected with a corrosion resistant material, protective liner or a coating and that wear and tear be assessed. Shaft seals also have to be designed so they can be replaced without having to withdraw the shaft, while bearing clearances and shaft coating measurements need to be retained onboard. Vessels operating seawater-lubricated systems also need to be fitted with a water filtration, separation or conditioning system capable of removing particles greater than 80μm, with samples taken under service conditions. Two independent sensors are also required to monitor water flow to the stern tube bearing, with any alarms recorded.